Habitat: Grassy hillsides, gravelly slopes, washes, coastal scrub to creosote-bush scrub and in the Opuntia bigelovii association. 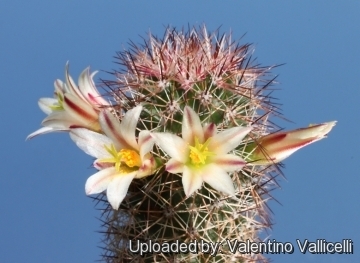 Mammillaria angelensis var. estebanensis (G.E.Linds.) Repp. 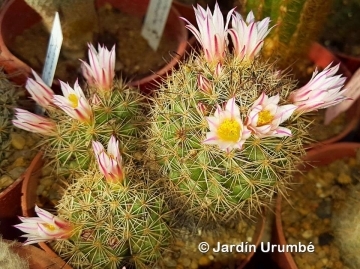 Mammillaria dioica f. estebanensis (G.E.Linds.) Neutel. 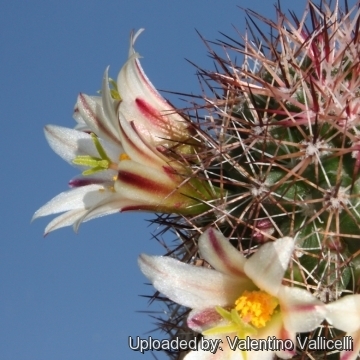 Mammillaria dioica f. incerta (Parish) Neutel. Mammillaria incerta Parish in Jeps. 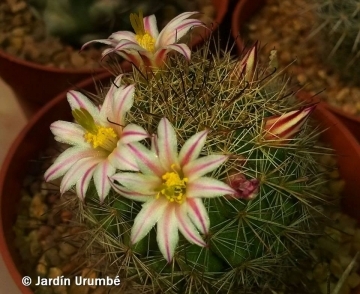 Description: Mammillaria dioica is a very spiny cactus often with flowers either all bisexual or all pistillate, a trait unusual for Cactaceae representatives. Habit: Solitary or with several stems from the base, sometimes branching. Plant-body: Spheric to long-cylindrical, 4-25 (or occasionally up to 33 cm tall), 3-7 cm in diameter, blue-green, rounded apically, but there is no apical mat of pubescence. Tubercles: Firm, short cylindrical, without latex. Flowers: Funnelform yellow to almost white with a pink or purplish midrib, 10-22 mm long, 20-40 cm in diameter, inner perianth-segments, 8 to12, cream to white usually notched at the apex; outer perianth parts entire to minutely fringed; styles white or greenish; stigma-lobes yellowish to green. The flowers usually are imperfectly unisexual, occurring on functionally dioecious plant, but some plants have flowers that are strictly female, with no stamens. Blooming season: Late winter to late spring. Fruit: Scarlet, ovoid to clavate, 10-25 mm long, sticking straight out from the stem, sometimes even remaining when a new round of flowers blooms. Seeds: black, shining, minutely pitted. 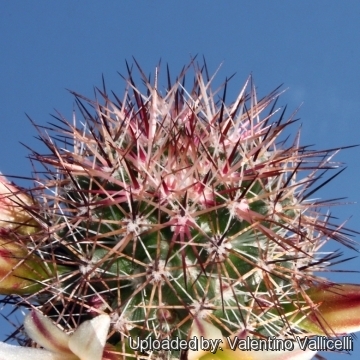 Remarks: The dense covering of spines reduces the interception of solar radiation by the stem surface lowering the risks of overheating the apex during a summer day and of freezing during a winter night. 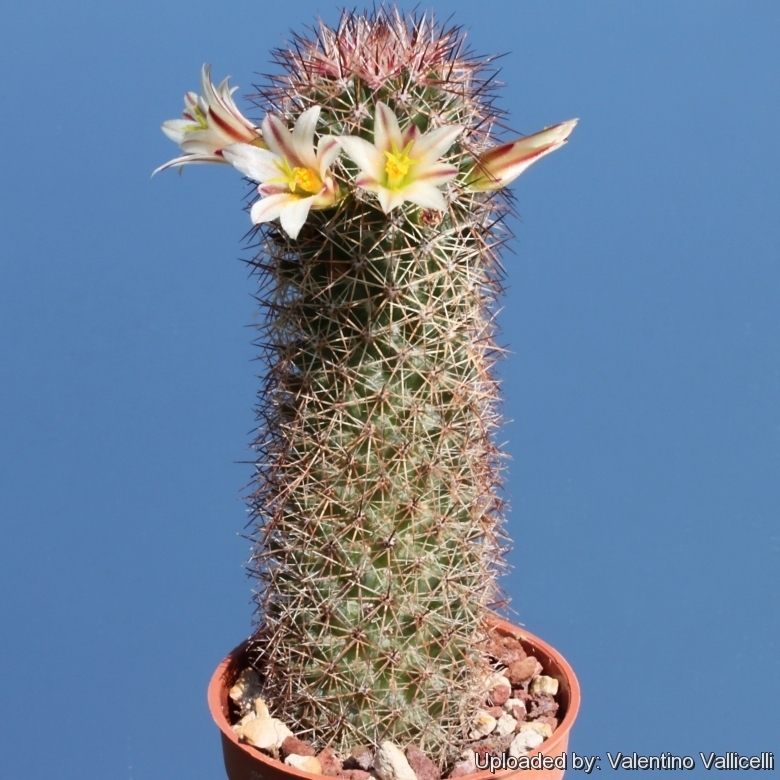 Cultivation and Propagation: Mammillaria dioica is somewhat difficult to cultivate. During the summer it is best to keep the plants outside where the temperature can rise to over 30° C with no harm to the plant, recommended for any collection that needs lots of light with ample airflow.